Introducing "THE BEAST", Ridgid's 10-inch Wet Tile Saw that's built to handle the largest tiles on commercial job sites. The integrated die-cast aluminium work table expands as needed to give full support on the largest tiles available, no matter the cut, and breaks down easily for transport. The heavy duty 15 amp, 1.5 hp motor will power through a variety of materials and its maximum cut capacity cuts 34-inches rip, 24-inches diagonal, and 3 3/4-inches deep. It all comes backed by the Ridgid Lifetime Service Warranty. The Big Clinker Tile Cutter from QEP is a professional quality tool that cuts 20-inch floor and wall tile, or a 16-inch tile diagonally. It includes a replaceable 7/8-inch titanium-coated tungsten carbide cutting wheel for accurate cutting and linear ball bearing slides for smooth scoring. Plus, its wide die-cast aluminum alloy base with heavy duty rubber pads offers complete cutting stability. 10 in. Wet Tile Saw with Stand Introducing "THE BEAST", Ridgid's 10-inch Wet Tile Saw that's built to handle the largest tiles on commercial job sites. The integrated die-cast aluminium work table expands as needed to give full support on the largest tiles available, no matter the cut, and breaks down easily for transport. 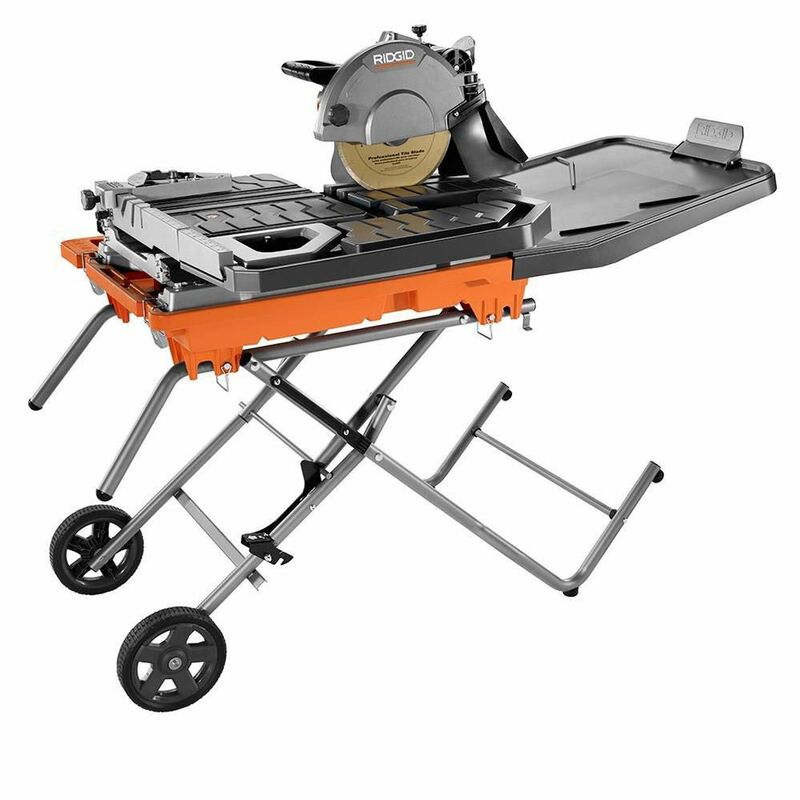 The heavy duty 15 amp, 1.5 hp motor will power through a variety of materials and its maximum cut capacity cuts 34-inches rip, 24-inches diagonal, and 3 3/4-inches deep. It all comes backed by the Ridgid Lifetime Service Warranty. 10 in. Wet Tile Saw with Stand is rated 3.8 out of 5 by 224. Rated 5 out of 5 by Scottiep from It's great, will do any job. It's great, will do any job. Rated 1 out of 5 by JMD4 from Inaccurate cuts on Brand New 10” Beast I purchased this saw because I had some large format tile I was installing. I had some expensive tile and wanted a good saw to get the job done. I did alot of research and read all the positive reviews online and was optimistic that this saw was going to do a great job. After un packaging and setting up the saw/table, you do need two people to put the folding table together. I got the chance to start cutting. I had uneven cuts on 24 inch cuts and even on a 12 inch cut it was 1/8 of inch off. Very challenging and difficult to get a square cut on the tile. I checked the squareness of the tile it was dead on. I ran to my local depot and picked up rigids 10” reinforced diamond blade with no change in behavior. I had even bought three different large format tiles to test on and I got the same result. The other thing I found interesting was the guide or roller catches and it’s not smooth after just a handful of cuts. So the behavior you get is as you’re pushing the tile towards the blade it catches and stops and you’ve got to push a little bit harder and it lunges and chips the tile. You could saw it was a frustrating process. I have Other rigid products like the chopsaw, vacuum and other tools and i havent had any issues. Sadly i really want to make this work. I think i got a bad egg or the lemon of the bunch. I really like the Ridgid brand i dont know what to do differently to get true cuts. Help Ridgid. Rated 1 out of 5 by kent from rigid 10 in wet saw Motor went out. Been waiting 2 months to be repaired. Rated 5 out of 5 by Anonymous from Named “the Beast” for a reason. Once laser adjusted... Named “the Beast” for a reason. Once laser adjusted for squareness, operates as intended. Much faster than other tile saw was using. Rated 4 out of 5 by Table from Box was beat up so the saw came with few... Box was beat up so the saw came with few scratches. Rated 5 out of 5 by Anonymous from Awesome product. Power, and ease. ... Awesome product. Power, and ease.